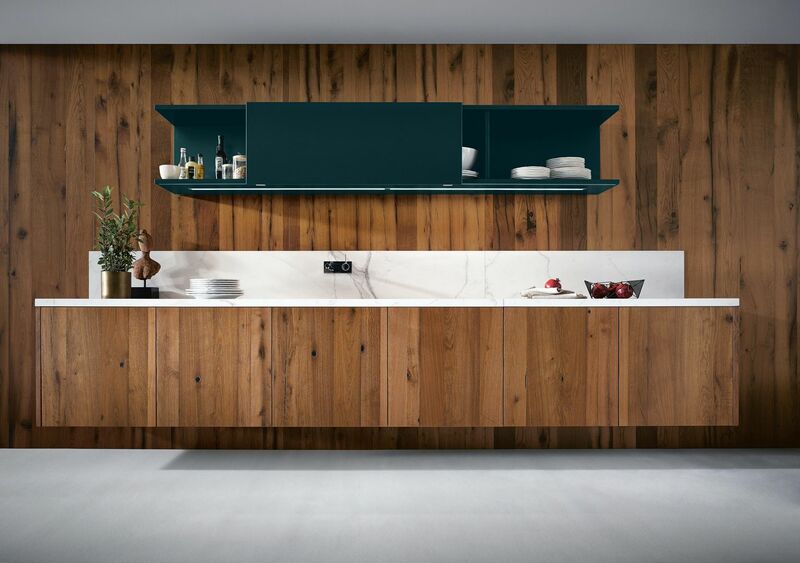 As with the Bauhaus concept, next125 focuses on the essential: authentic materials and a timeless design combine to create effectively purist and functional kitchens. next125 cooking table – the free-standing statement in the kitchen. Its inclined legs make the cooking table a purist eye-catcher. The stated objective: to combine a straightforward style with functionality. NX 950 – the freestanding cooking area appears to have been hewn from a single block. The radiation of the low base works like a shadow joint. 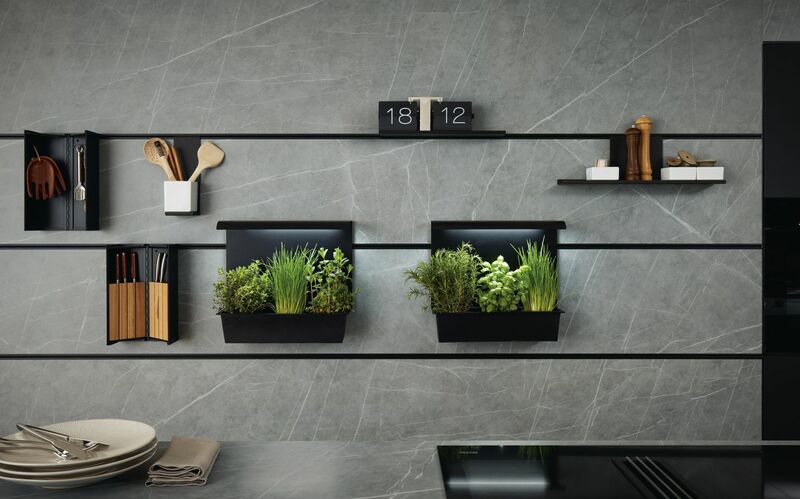 next125 wall-mounted – opens up unimaginable freedom in kitchen planning. "Art and technology – a new unity" is the title of a 1923 dissertation by the founder of the Bauhaus movement, Walter Gropius. In it, he justifies straightforward design characterized by clear objectivity. The stated objective: to combine a straightforward style with functionality. 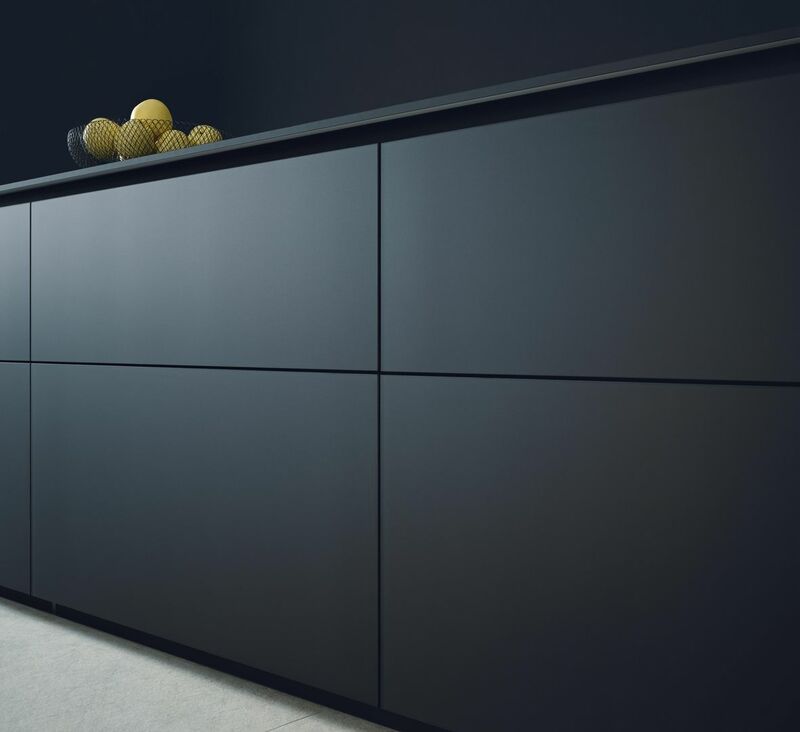 A philosophy reflected in next125 kitchens, in their unobtrusive elegance and thoughtfulness down to the smallest detail: thanks to the grid size and the front division, a visual unity is created – without neglecting functional requirements such as sufficient storage space. single line – the front optics provide for even clearer lines. As with the Bauhaus concept, next125 focuses on the essential. Despite all of the reductions, the kitchen design is always based on the joy of experimentation. From the next125 cube recess system through to the laminate front with a low-maintenance surface – the unique design thrives on simplification. 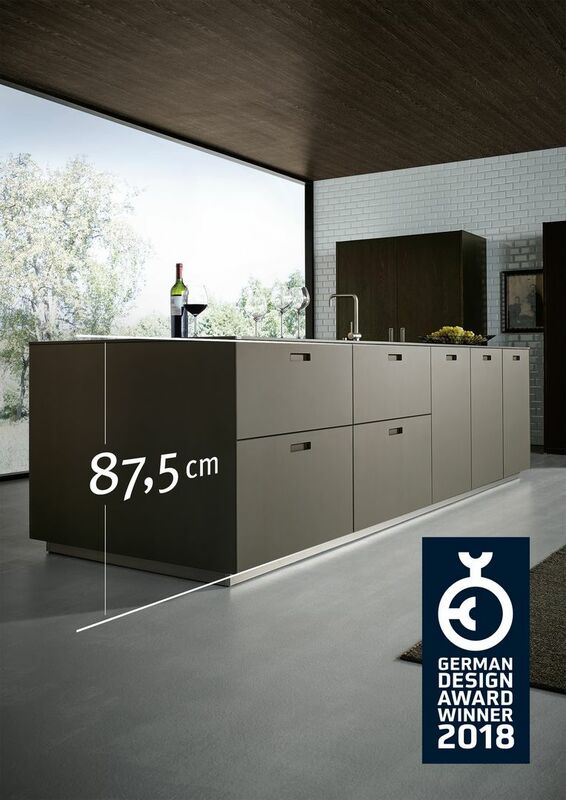 Thanks to this, next125 has won many awards: the most recent being the coveted German Design Award 2018, awarded for the 87.5 mm carcase height. next125 cube – Black is the new subject: To follow the topical spirit of the times, the niche system is offered to the implementation in aluminium high-grade steel colours now also in aluminium onyx black. Award-winning working height – next125 won the German Design Award 2018 for the carcase height of 87.5 cm. The cubic use of forms brings at the same time more cuddy. Both in its architecture and in its industrial design, the Bauhaus design leads to timelessness. 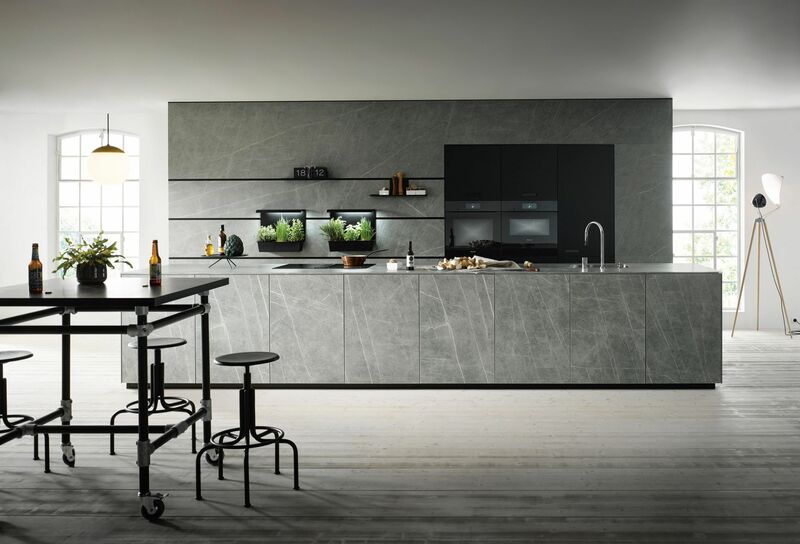 The best examples for an effectively reduced and functional design are the free-standing cooking table, the wall-mounted kitchen elements, the variable carcase heights, units with retractable doors and wall units with sliding doors. With their clean edges and reduced forms, next125 opens up a high degree of planning freedom and allows room for greater individuality. An individuality that with its elegance, function and aesthetics creates new age design classics. Classics that can be combined flexibly in accordance with individual needs and taste to create a uniquely personal unity of art and technology. 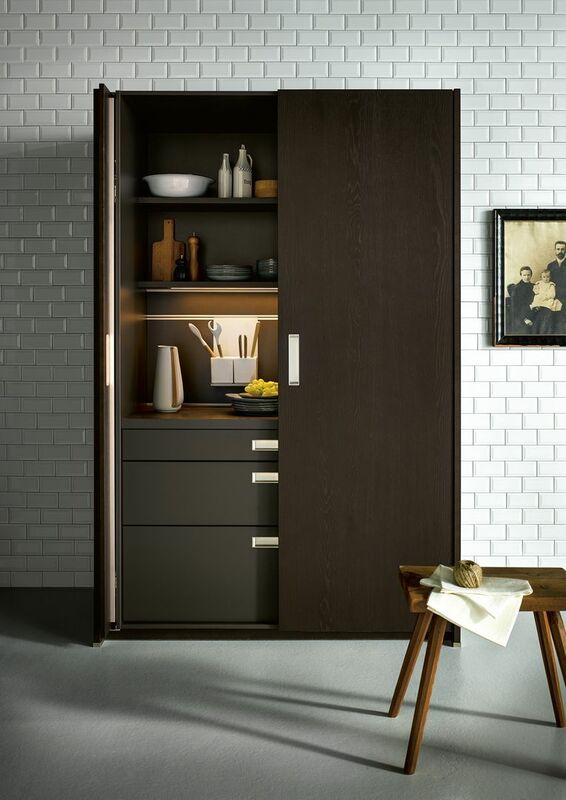 Tall units with retractable doors – provide a homely and tidy look in almost no time. 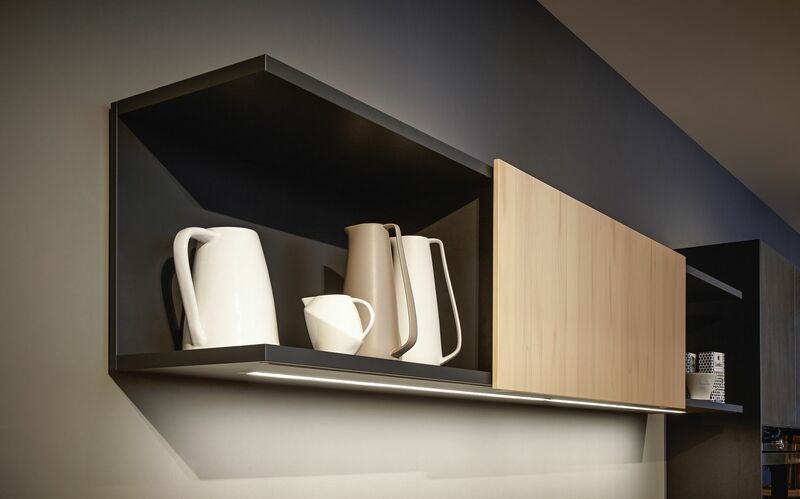 next125 open shelf unit with sliding door – clear use of forms till the smallest corner.